Mash the berries through a sieve (use a whisk to get more juice out) or a food mill to remove the seeds. It should yield about 6 cups of pulpy berries. Add the sugar, vanilla bean scrapings and blackberries to a large pot. Tie the vanilla beans together with kitchen twine and attach them to the side of the pan or cut them up and stuff them into a tea ball. Allow to the beans to float in the pan. Prep jars/lids for canning. Bring to a boil. Boil for about 10-15 minutes. Stir in the pectin and lemon juice. Continue cooking at a low (rolling) boil for 5 minutes. Discard the beans. Fill the jars leaving 1/4 inch headroom. Process in the hot water bath for 10 minutes. I made this a little earlier in the summer but just opened a jar of it for the first time yesterday. I love the combination of blackberry and vanilla so I was extra interested to see if my jam experiment worked and I was excited to see that it had. I would say the jam is 70% blackberry-y and 30% vanilla-y, which I think is the perfect ratio. Normally, I don't bother removing the seeds from jam but blackberry seeds are pretty big. I actually sort of like the seeds when I am eating a berry fresh from the bush but in jam, they sort of just make everything crunchy and stick in your teeth. It only took a few minutes to run it through the food mill. I had my husband do it while we watched British television on DVD. Alternately, I think you could mash them through a mesh strainer but that would take quite a bit more muscle. If you don't mind some seeds, de-seeding 50-70% of the berries and leaving the rest whole is another option. 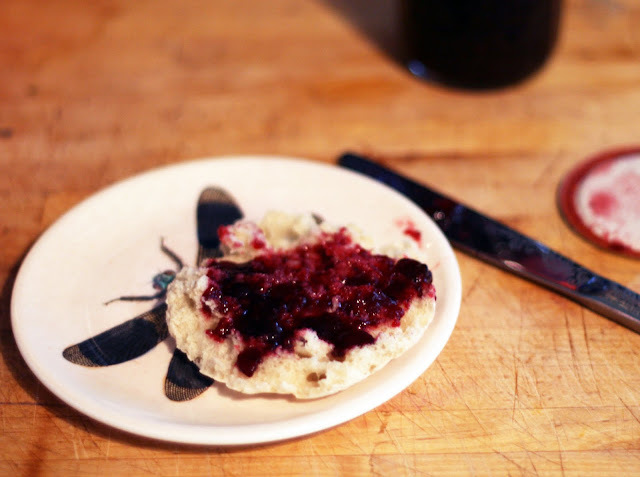 So, go hunt down some late summer blackberries and make this jam!